We all know the Apostle Paul wrote the letters to the Corinthians. I was reading through 1st Corinthians and noticed Paul was correcting the church on many things. MANY things. In chapter 10, Paul was reminding the church in Corinth about the punishment, and harsh it was, the early Jews suffered for not obeying God. There were points Paul made about what to eat, but more important was the ‘how’ or in what manner and intent we should take nourishment. When we play around and mess with meals mixed in with idolatry, we’re in for a heap of trouble. When we take nourishment into our bodies in which to glorify God, we’re in good standing. You can make it more complex if you wish, but unless I missed something really important, that’s the gig, and primarily what Paul intended by what he wrote to the Corinthians in a couple verses contained in within his letter. It got me thinking about the method in which we prepare our meals and the context and intent in which we approach these things today. 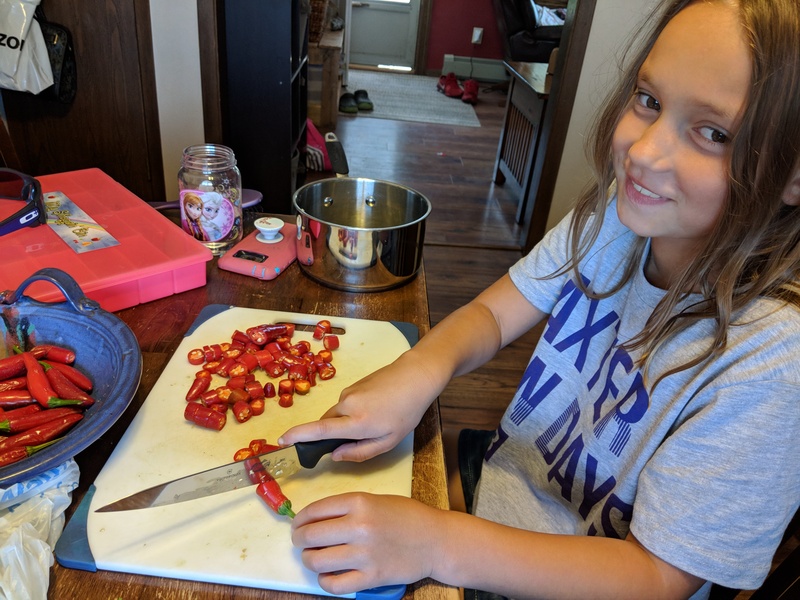 My daughter and I cook together a little bit. Nothing really serious, just basic stuff. We chop up veggies for salsa, throw together a yummy soup, grill some steaks or brats, and so on. Nothing real fancy or special, but I enjoy it because I have found it something we can do together that hopefully will continue to transcend age, social focus, or spurts of mood and attitude as we age. She’s gotta eat, right? Besides, if I instill some healthy habits and also show her that trying some new things is encouraged, I’ll have won a battle or two that too few attempt these days. That brings me to tater salad. If you think about it after breaking two words down, it doesn’t sound that appealing. I mean, who thinks a potato is likely to make a good salad? Few. Darned few. But, the fact is they come out pretty well. My daughter and I had searched for a good recipe to make and we weren’t really having much luck. Bacon is a general prerequisite from her for nearly everything (yes, Dads out there, I’m very proud). So we decided to toss the word “bacon” into our google search for potato salad recipes, and a several came up. We decided to glean the best parts of each into our own recipe and add tweaks if necessary. Frankly, it came out very well. I’ll admit KK lost interest about half way through the first time, but we’ve worked together since then on it and I think overall we have a winner. The discussions we’ve held during our cooking and food prep have been tremendous. I find it a really easy time to discuss faith and all biblical matters as they were intended and how we can apply them to our daily living. Simply put, it is easy to visit while you’re boiling taters and chopping veggies from the garden. For whatever reason the pressure of a ‘sit down’ conversation is alleviated and the free flow of discussion is far more effortless. For as long as recorded history people bonded over meal prep and the breaking of bread. As we rightly recognize our fast-paced world is pushing us away from this kind of thing, I find it necessary to resist that push, and instead foster the “family” portion of this. Meal prep especially in the evening, and consumption, are very family oriented and centered. ….Or should be. We build a meal together and consume as a family, saying our prayers, and offering thoughts and commitment before God. These acts are significant, and in many cases telling about us, our focus, and our direction. Couldn’t we easily define “communion” this way? So I say to you, find that recipe, even if it is the addition of a pinch of salt to prepackaged macaroni, and cook with your children. Work side by side, make the opportunity to discuss Him and the importance of our day, and take nourishment to your mind, body, and soul so it may glorify Him. 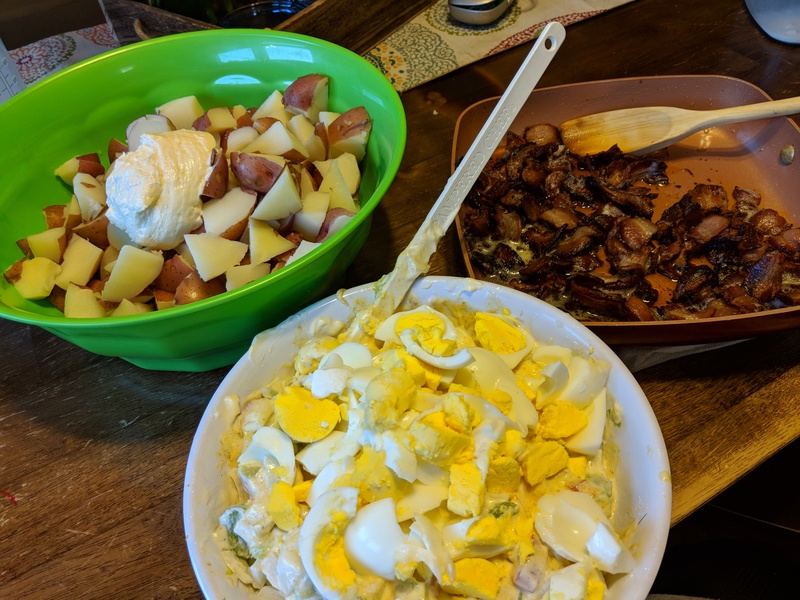 As a special treat, I have uploaded a copy of KKs Best Ever Potato Salad recipe. Download it and share it around. Tweak it with your family and make it your own. That’s what we did. PS – I’ll let you all in on a little secret. It isn’t only the side by side act of cooking and meal prep that work to visit unencumbered with people. Nearly any kind of work does the same thing. I just chose this, since the example fit well, and it gave us pause for consideration. 😉 Make the idea work for you and yours as mutual beneficiaries with Him.